What role for central bank balance sheets in the conduct of monetary policy? The ECB on neutral ground? The involvement of the European Central Bank (ECB) in the fiscal management of the euro area member states has been a subject of ongoing controversy. Since the implementation of the ECB programme to purchase sovereign debt, it has been accused of profiting off of troubled states and taking the risk of socializing losses. The rise of these controversies results from the difficulty in understanding the relationship between the ECB, the national central banks (NCBs), and the governments. The European monetary architecture comes down to a sequence of delegations of power. Decisions on the conduct of monetary policy in the euro area are delegated to an independent institution, the European Central Bank (ECB). But, under the European subsidiarity principle, the implementation of monetary policy is then delegated to the national central banks (NCBs) of the euro area member states: the ECB and NCBs taken together are called the Eurosystem. While up to now this dimension of the organization of the euro area’s monetary policy has not attracted much attention, debate has recently arisen in the course of the implementation of the quantitative easing programme. According to commentators and journalists, some national central banks are profiting more than others from the policy of buying and supporting their national public debts, which are riskier than the debt in more “virtuous” countries. The profiting banks are viewed as escaping the ECB’s control and not strictly applying the policy decided in Frankfurt. In a recent paper prepared as part of the European Parliament’s Monetary Dialogue with the ECB, we show that these concerns are unfounded for the simple good reason that, on average, since the beginning of the implementation of this policy, the theoretical distribution key has been respected (graphic). 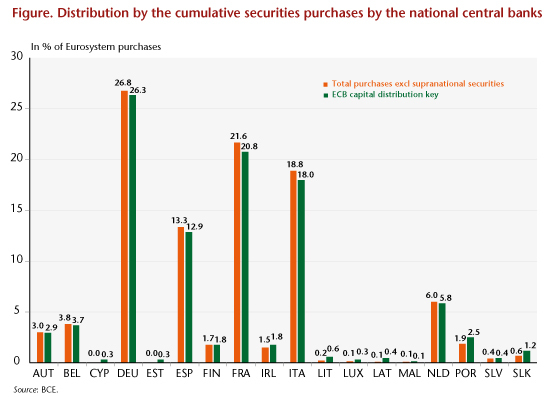 This distribution key stipulates that purchases of bonds by the Eurosystem are to be made pro rata to a state’s participation in the ECB’s capital. Remember that part of the purchases – 10 of the 60 billion in monthly purchases made under the programme – are made directly by the ECB. The other purchases are made directly by the NCBs. As each central bank buys securities issued by its own government, the NCBs’ purchases of public bonds do not entail risk-sharing between member states. Any profits or losses are kept on the NCBs’ balance sheets or transferred to the national governments in accordance with the agreements in force in each country. This distribution of public bond purchases, which is intended to be neutral in terms of risk management, isn’t entirely so, but not for the reasons that seem to have worried the European Parliament’s Committee on Economic and Monetary Affairs. This distribution favours the maintenance of very low rates of return on the debts of certain member states. In fact, by not basing itself on the financing needs of the member states or on the size of their public debts, it can produce distortions by reducing the supply of public bonds available on the secondary markets. 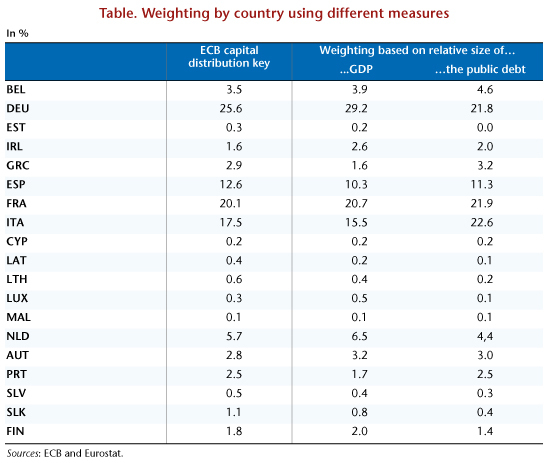 Such may be the case in Germany, Spain and the Netherlands, whose shares of the European public debt are smaller than their respective shares in the ECB’s capital (table). Conversely, the purchases of Italian bonds are smaller with the current distribution key than they would be with a distribution key that took into account the relative size of the public debt. The ECB’s policy therefore has less impact on the Italian debt market than it does on the German market. This orientation could also constrain the ECB’s decision about continuing quantitative easing beyond December 2017. Let’s agree that the ECB’s best policy would be to continue the current policy beyond December 2017, but to stop it once and for all in July 2018. Given the current distribution rules, this policy would be subject to all countries having exchangeable government bonds until July 2018, including those who issue public debt only rarely because they have low financing needs. It could be that it is impossible to continue this policy under the rules currently adopted by the ECB, because some countries do not have sufficient debt available. It would then be necessary to implement a different policy by drastically reducing the monthly purchases of short-term securities (say in January 2018), while possibly pursuing this policy for a longer time period (beyond the first half of 2018). The decision not to use risk-sharing in the management of European monetary policy is therefore far from being neutral in the way this policy is actually implemented. Mario Draghi was questioned about the distribution of the public sector purchase programme (PSPP) at the press conference he held on 8 September 2017. There is risk-sharing on this sum: the gains or losses are shared by all the NCBs in proportion to their contribution to the ECB’s capital. What factors are behind the recent rise in long-term interest rates? Slowing growth: due to the supply side? The weakness of the recovery in 2014 and 2015 raises the need for a structural re-examination of the state of France’s productive fabric. Indeed, an analysis of investment dynamics, the trade balance, productivity gains and business margins, and to a lesser extent companies’ access to credit, indicates the existence of some disturbing trends since the early noughties. In addition, the persistence of the crisis inevitably poses the question of the unravelling of France’s productive fabric since 2007 due to a combination of low growth, weak investment and numerous bankruptcies. Rising inequality in income and wealth has become a key issue in discussions of economic policy, and the topic has inserted itself into evaluations of the impact of monetary policy in the US and Japan, the precursors of today’s massive quantitative easing programmes (QE). The question is thus posed as to whether the ECB’s QE policy has had or will have redistributive effects.